If you drew with textured lines that are either too light or too dark, you can adjust the line texture opacity of your drawings. In the Timeline view, select the drawing that contains the opacity you want to adjust. 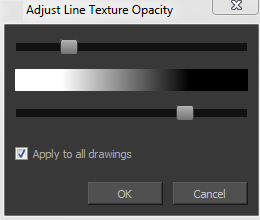 In the Camera view menu, select Drawing > Adjust Line Texture Opacity.